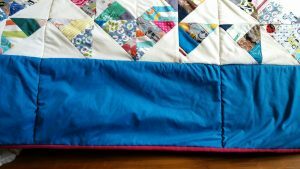 It’s been some time since a sewing related post. This does ot mean I have given up on sewing, in fact I have had several successful dressmaking makes this summer, it’s just it’s practically impossible to get a decent photo of any of them. For some reason whenever I ask the OH to take a photo of me wearing a make, they turn out all blurry. I may look into investing in a proper camera and a tripod. Not just for blog photos of course, I think a proper camera would be nice for taking photos of the little man instead of just using mobiles and then leaving the photos on there forever more (actually, all my photos get backed up to flickr or Google photos and we do order some prints but when on holiday I don’t always want to keep the phone on in case I want to take pictures, I want to be on holiday without the mobile tether to home/work/the real world). 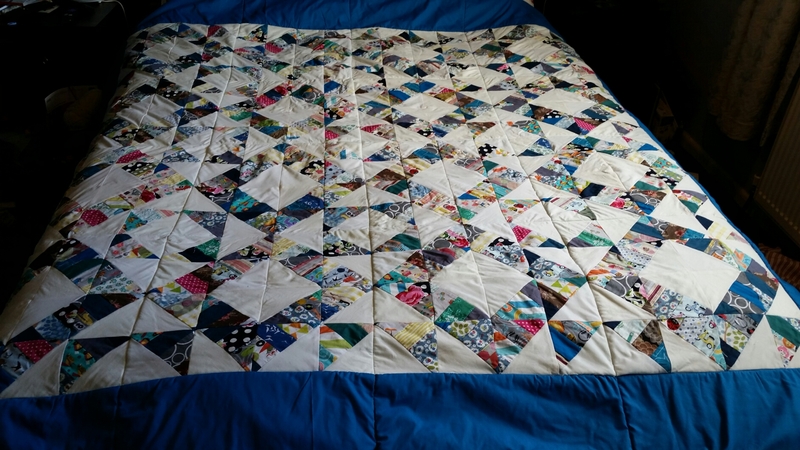 Anyhoo, here is what I think of as a quite rushed quilt project even though I started it at the beginning of the year. My little sister turned 30 in September and just as with my other sister, I wanted her to have a quilt she could keep. I tried 2 new techniques with this and I have to say the jury is out on them and this may explain why as much as I love my sister and she absolutely loves this quilt, I am somewhat ambivalent about it. First up, I tried out the Quilt As You Go method as described in this book which I got for my birthday. I’m not sure it was the right way to go with this block, or maybe I should have pieced the whole block and then quilted each one rather than doing it row by row. I don’t know. I am looking forward to trying the method out again on smaller projects or a more casual block pattern though. Secondly, I used the quilting kit I got with my sewing machine and hadn’t taken out of the box until now. I tried the walking foot. I’m not sure. The extension table was great though. I also used the stitch in the ditch foot to quilt the already quilted top and batting to the backing fabric. With mixed results. Again, i think this will work better on smaller projects not a quilt big enough for a double bed. I think I should stick to hand quilting the big projects. 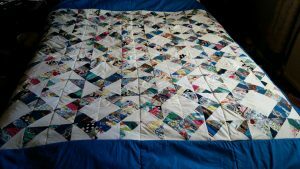 The quilt was made using an assortment of leftover fabrics which have a lot of meaning to me, if not actually for my sister. I really liked this idea at first, but it produced a lot of bulky seams. I think maybe I should have pressed them all open for more evenness. 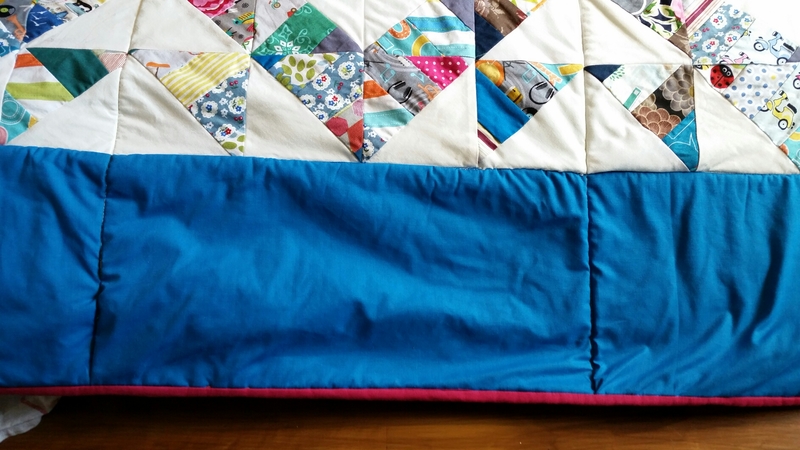 The border is a blue polycotton sheeting from ebay and the shocking pink binding is the same. I think the backing was a polycotton or maybe it was 100% cotton, I can’t quite remember, from Calico Laine. These were actually really nice fabrics and the best I could afford. The wadding is the stuff made from the recycled bottles that I always use. 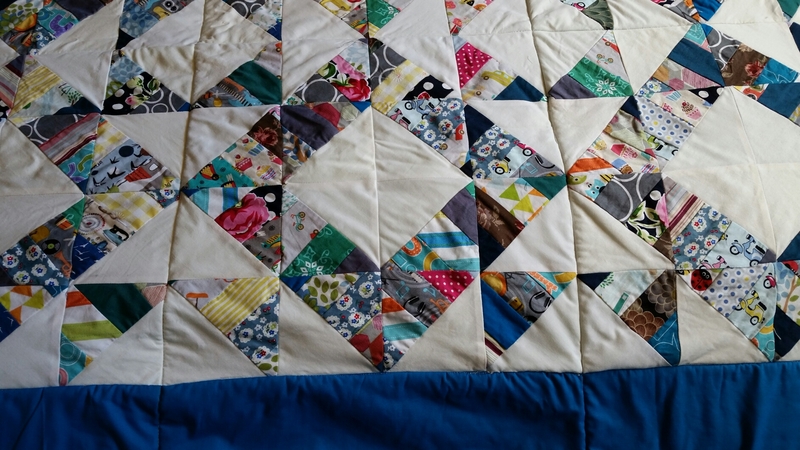 I really like it and I think it suits the thrifty nature of the quilt. So there we have it. As ever, when working on a quilt I rediscover my love of patchwork and have gone crazy on organising my leftover fabrics, cutting up and sorting into 1 1/2″ strips and squares, 2 1/2″ strips and squares, 3″ and 5″ squares, in the hopes that I can just get to the good sewing part with all my scraps, already cut and ironed and sorted! I’m thinking that I would quite like to really take my time and make an Irish Chain quilt for myself. 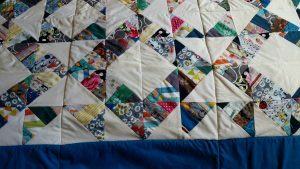 Anyway, despite my feelings towards the quilt, my sister really loves it so that’s all good.